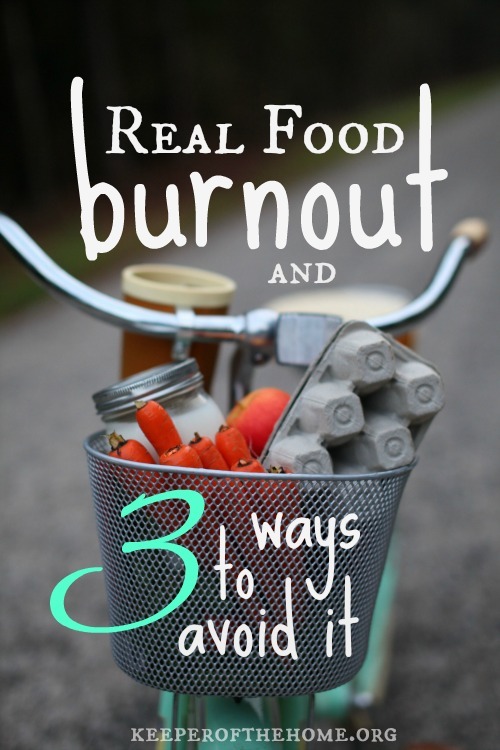 Have you ever suffered from Real Food Burnout? It’s an actual condition, people! Symptoms include an aversion to the kitchen, phobia regarding shopping or menu planning, and surprisingly strong cravings for junk food. Sufferers often experience amnesia in regards to meal ideas, paralysis when it comes to trying something new, and general depression on the topic of food. How do I know so much about this condition? Because I’m a recovering victim myself. I succumb to Real Food Burnout when I only focus on the list of things I want to change, when I forget that eating well is a journey, and when I think that my health is all up to me. Sometimes burnout episodes last for days or weeks, but in extreme cases, patients give up and never try to eat healthy again. Visit me over there? 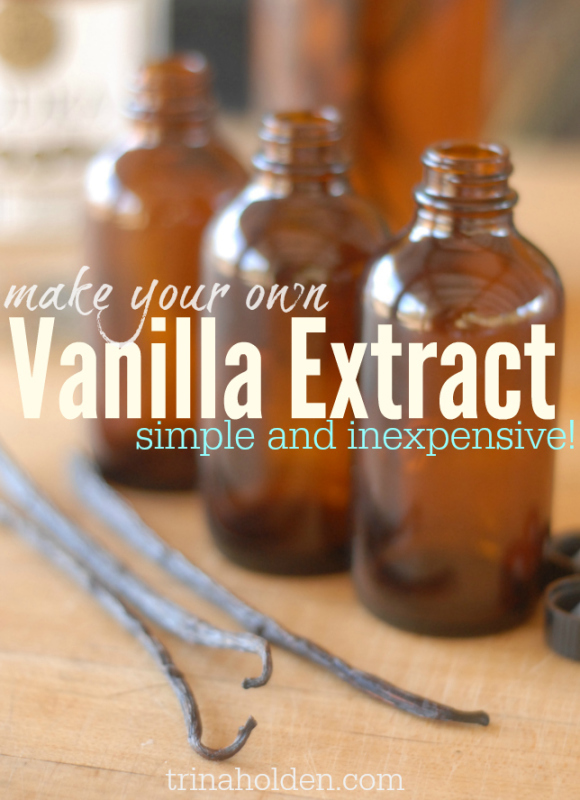 Breaking Free From Real Food Burnout on Keeper of the Home. I was racing around my kitchen the night before a road trip, scrambling to collect and create enough nourishing snacks so we wouldn’t have to rely on road food the whole trip, when I realized I was in “chicken with my head cut off mode”. Knowing that that’s not a healthy state of mind to be in, I paused just long enough to ask myself—what would it look like to not worry about what we ate? And what would it take for me to get to that point? Would it take a larger food budget? More time? Better equipped kitchen? I sensed in my spirit that wasn’t the root of my problem, nor would more money or time be the answer to my stress. Would I still eat the way I do? Yes. 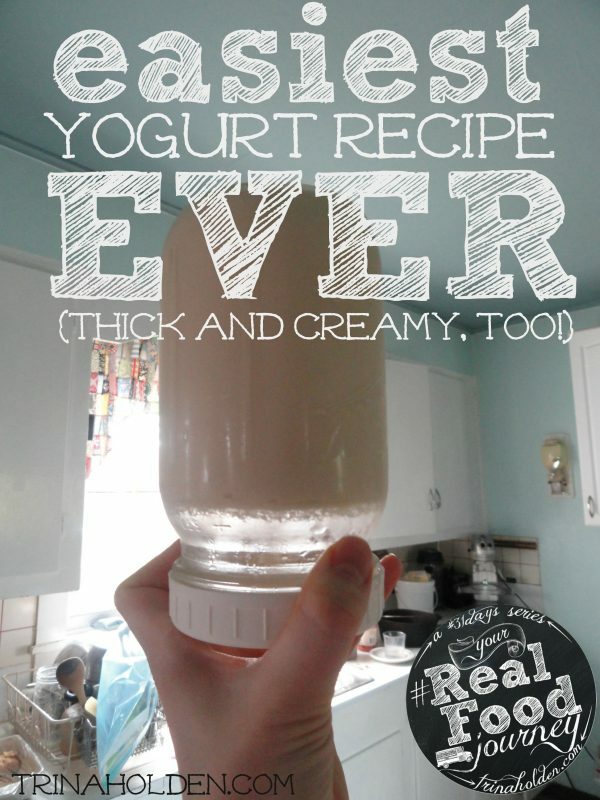 Would I still be making yogurt the day before a trip to make sure we have good probiotics in our tummy on the road? Probably. What would be different? Could it be different? That’s when I realized that my anxiety in regards to feeding my family well would not diminish until I realized that it was a matter of misplaced trust. God created my body. He numbers the hairs on my head and keeps my heart beating in my chest without me having to give it a thought. He alone knows the mysteries of my brain, hormones, nerves, and cells. 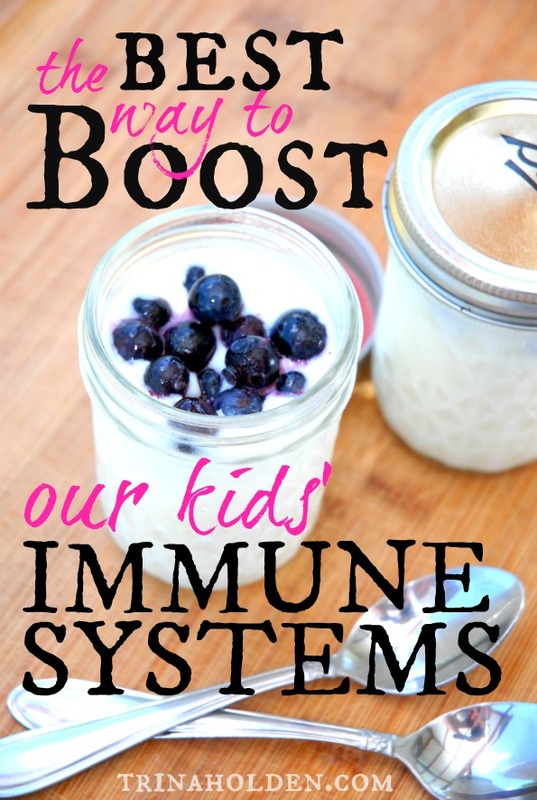 When I take an obsessive approach to nourishing my family I’m forgetting that my body is not a machine that I can only hope to maintain well. It’s a miracle created by a loving Father who knows my body and my needs better than myself, and has a history of nourishing and healing that body in ways that defy human logic and efforts. And here I am worried about a few snacks on a two day road trip. When we worry in our kitchens, we are forgetting that the food we eat is not the biggest factor in our well being. The biggest reason you and I are breathing, thinking, and reading these words and understanding them is not because of what you ate for breakfast this morning, but because of the power and love of the God of the Universe. That’s why I wrote this book–because you and I both need the reminder that this whole thing is a journey, not a target we have to hit the first time. So, slow down, friend. Take a deep breath. It’s not all up to you. You don’t have to do it all today, or learn all the things this week, or completely change your diet this month.Take a deep breath–there’s another way. 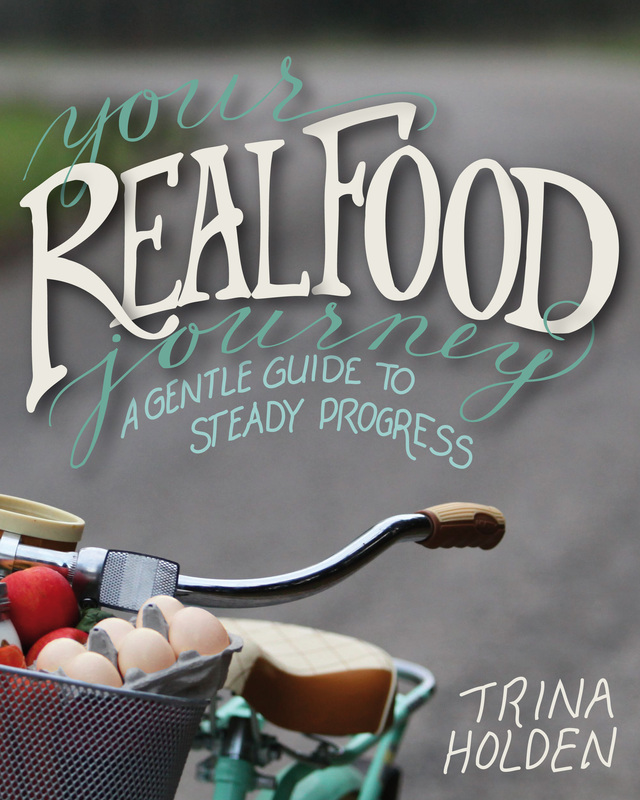 Your Real Food Journey: a gentle guide to steady progress is my newest cookbook that I wrote just for those of us who have gotten a bit winded in the effort to feed our families well. With eight years’ experience preparing and serving traditional, whole foods to my family, I’ve learned a couple things along the way. Eating better is not so much about the equipment you have or the grocery store you can afford to shop at. Joy and success will be found in making one small change at a time, while trusting that our Maker is sustaining us. 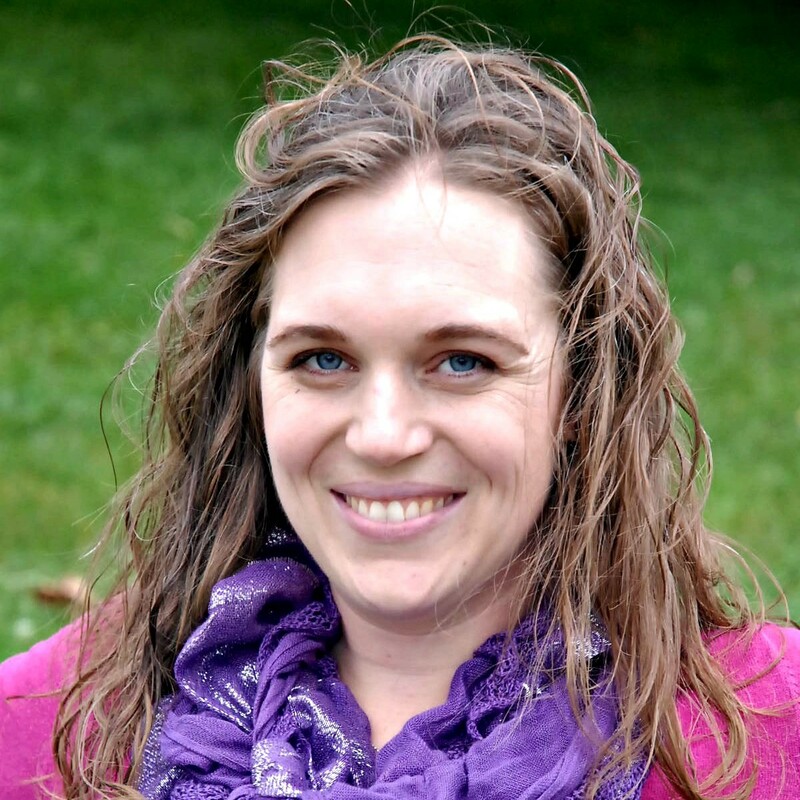 If you’ve spent way too much time down the bunny hole of the internet trying to figure out what the real food diet looks like for real families, let me break it down for you into simple explanations and practical stuff you can do today. If you’ve gotten burnt out on this track, let me show you a more gentle approach. 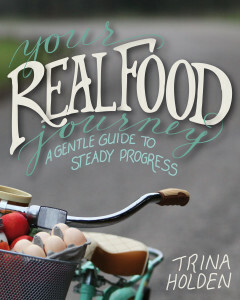 If you love eating healthy but it feels like more of a burden than a blessing—this book will lighten that load. 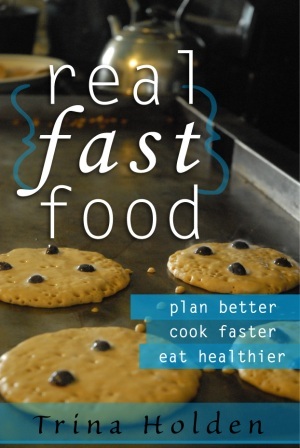 Let’s slow down and stop stressing about what we’re eating and feeding our families. Let’s take it one step, skill, and recipe at a time. Because real food is not a target we have to hit the first time—it’s a journey to be enjoyed. 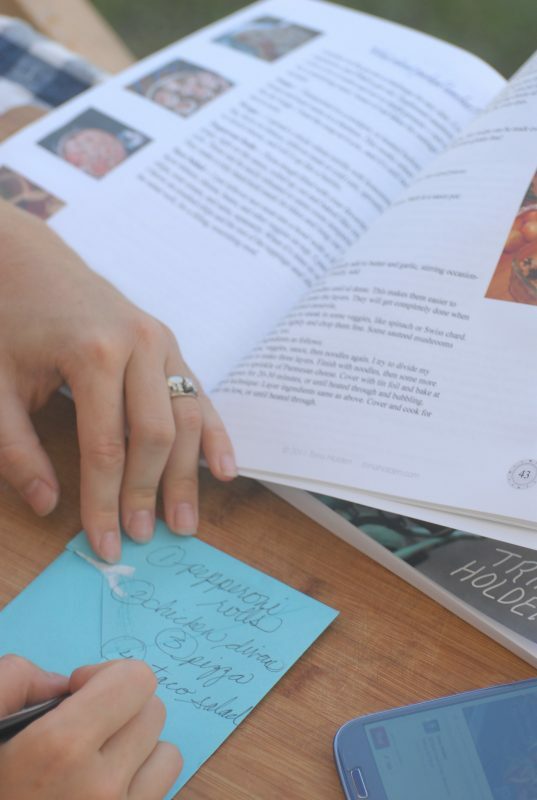 Get a peek inside the book here! The other day I made a pound cake. With white flour and sugar. Does this shock you? Have I completely lost my credibility as a real food blogger? I hope not, because I have a really important point to make in this story. We were living in the bus at that month. 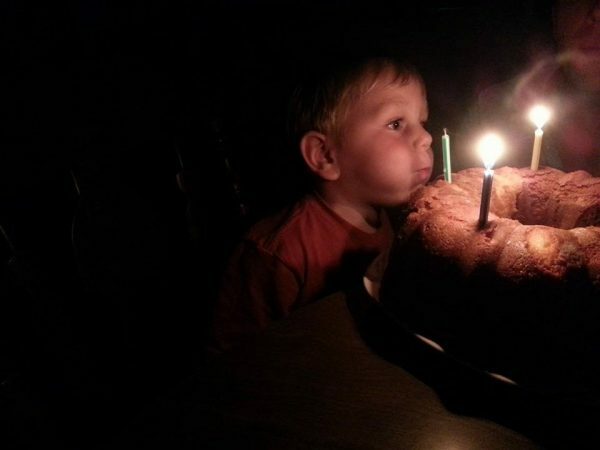 I was making a pound cake for my son’s birthday because it only required very basic ingredients, and would be yummy enough without frosting (it’s all about simplicity on the bus, dontchaknow). Problem: half of our family and Seth’s aunts and uncles love chocolate. The other half don’t (I know, I don’t get it, either). 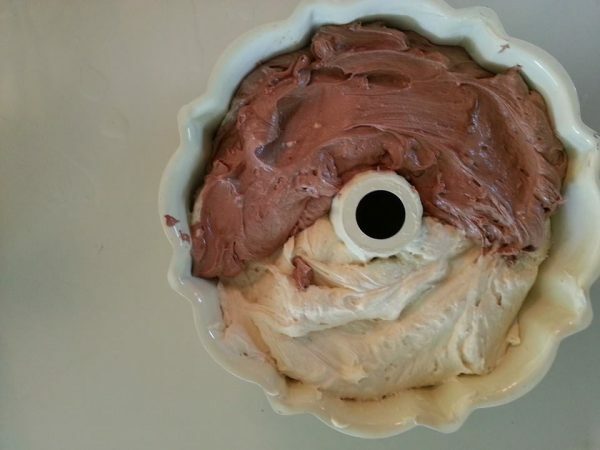 Personally, I was craving chocolate, but didn’t want to make a dessert that only half the party would enjoy. So, I compromised. I mixed up a lovely vanilla pound cake, and poured half of the rather thick batter into the pan. Then I stirred in a heaping measure of cocoa powder into the remaining batter, and poured that into the other half of the pan. It was a beautiful marriage of delectable batters, and it baked up beautifully. I wish you could have smelled it, let alone tasted it. Everyone was delighted (including Seth). What does this cake have to do with your real food journey? There will be days when you will struggle to please both parties–the voice in your head that is full of your accumulated real food knowledge, and the voice of reality that says you only have so much time or money or energy–will be at odds with each other. You will have to make a choice that is a nod to both your ideals and your reality. 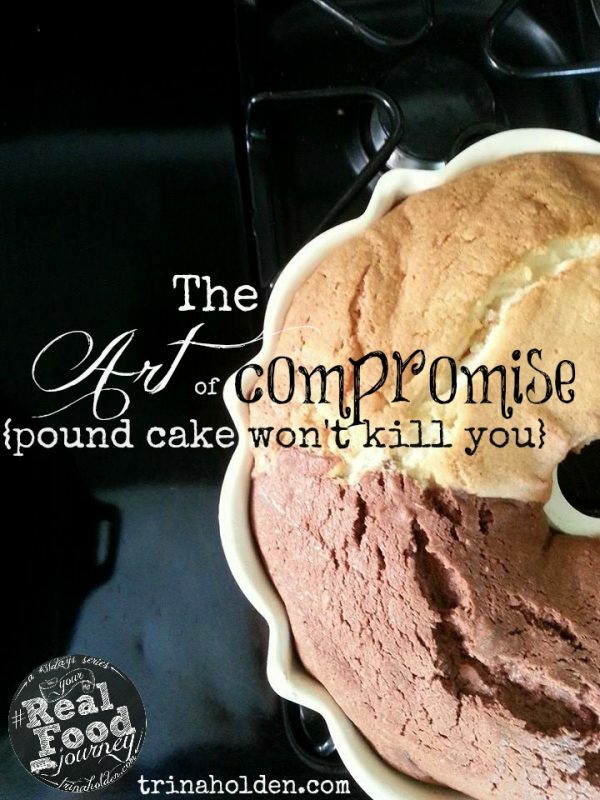 You will have to compromise. And you know what? It will be OK. You will live. You will not die from one white flour/white sugar pound cake. And life will be full and rich and sweet. And stress need not flavor every meal you make. So, as we close this month-long series, my final piece of advice to you is this: Be intentional in your food choices for your family, realizing that compromise will be a regular part of the process. The fact that you are making the effort to become more conscious of healthy eating habits is key, even if it doesn’t show up in ever meal from this moment on. 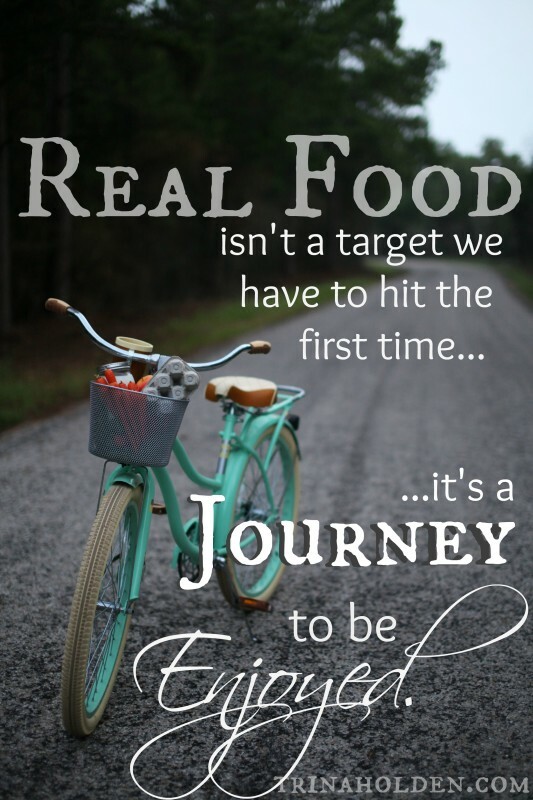 Real food is a process–let your goal be to embrace the journey. 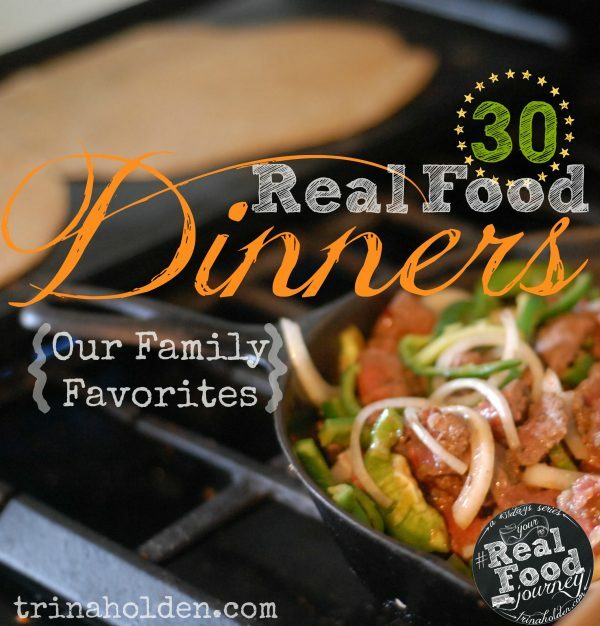 It’s been absolutetudenly delightful to have you join me this month on our Real Food Journey. If you have further questions, or topics you’d like me to cover in future posts, don’t hesitate to join the conversation on my Q&A post, or contact me. Ready for your next step? It’s time to get cooking!